Your little one in one of a kind and she needs a one piece unlike any other! With an ultra modern explosion of Moroccan inspired trendy geometric prints in vibrant shades of sapphire, emerald, amethyst, ruby, magenta, and cherry, with violet accent straps, the Finz Kool Kaleidoscope Zag Girls’ Print X Factor One Piece is easily one of the most beautiful looks you will find at any pool on the planet! 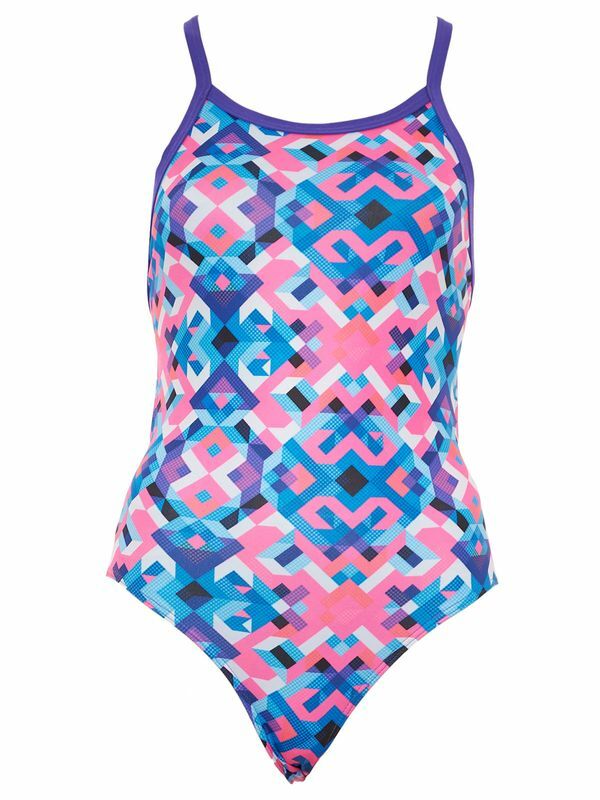 Made with 100% PBT Finz Aquashield fabric, the Finz Kool Kaleidoscope Zag Girls’ Print X Factor One Piece is built to last through endless hours in chlorine water and, thanks to the UPF 50+ sun protection, this one piece is perfect for long afternoons at the beach.